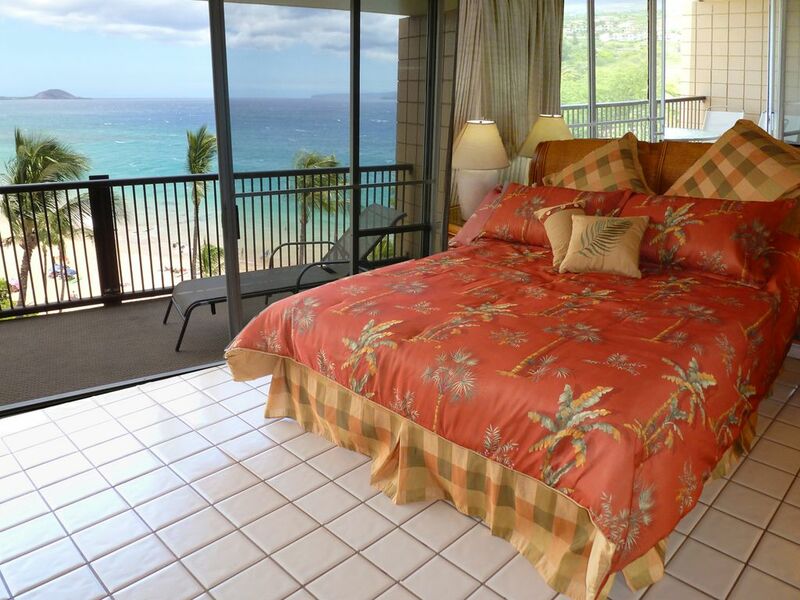 Top Floor Mana Kai Maui Beachfront Condo with Full A/C. We have totally redone both bathrooms, and also install a new sliding room divider to go with an artist decorated condo. Free High Speed Internet. Breathtaking, above the palm trees, panoramic ocean views out to the islands, down entire Coastline and up to Haleakala Volcano! Amazing Whale-watching from our lanai! Mana Kai Maui sits out on a point at the northern end of Keawakapu beach. Keawakapu is consistently rated as one of the best beaches on Maui, and with a few steps you can feel its sand below your feet. You can stroll down a mile of this uncrowded Golden Sandy Beach, and experience the best Maui has to offer. The Mana Kai is written up in travel guides as the finest location with the best climate on all of Maui. To see for yourself, do a google map satellite view of the Kihei coast. It won't allow you to hear the sound of waves that our condo provides, or sit out on our cradled from the wind top floor lanai, but that is only a click away. The Mana Kai Resort completed a 5 million dollar renovation to the entire complex in January of 2008, and those who pick our amazing location get exactly that. You do not add chance to the equation of where in the Mana Kai you find yourself. You have spent a lot of time and effort to get to Maui - make sure you treat yourself to the best you can find. Here is what else comes with your experience. Lovely decor. Original art of Maui by artist-owner, new queen hideabed in living room. Totally remodeled and expanded kitchen. Fine top-rated Restaurant & Lounge on ground floor. Top of the Line Fine Deli open to 9 PM, travel desk, beauty parlor, Best snorkeling spot. Beautiful grounds, beautiful pool with waterfall, velvety lawn touching the beach. No more spectacular and romantic spot in the world than that of the Mana Kai Maui! It is truly a Paradise location, Heaven on Earth! The Mana Kai sits on the southern most part of Kihei, and actually relates more to Wailea in feel. What we do have over Wailea is proximity to the beach. Most of the places to stay in Wailea are up the hill, and, in at lot of cases, a long trudge to the water. Our 2nd bedroom at the Mana Kai Maui(also designed to serve as a separate 'hotel unit' with its own entrance and total privacy) has a bar-height frig, microwave,high speed internet, small table with 2 chairs, air conditioning, mirrored closet doors, built-in cabinet for your coffeemaker, snacks, etc. It is newly remodeled with a beautiful picture window ocean view looking up the coastline towards Lahaina. Both bedrooms have king beds, bath with tub and shower. The Mana Kai Maui sits at right angles to the water's edge out on a point looking back on the entire coastline. One of the great advantages of the Mana Kai's setting is that our lanai (balcony) is in the lee of the wind. It is one of those seemingly small details that looms large in the vacationer's ultimate enjoyment. A lanai facing into the wind will be much less pleasurable or utilized. Walk down the glorious sandy beach to the newest and most spectacular hotels on Maui. Close to shopping, markets (within a mile) golf, tennis, and all the conveniences you want when you come to Maui. Your vacation at the Mana Kai Maui will be memorable for a lifetime! Staying in our private top floor condo will assure that! Aloha! This is a family business with Ken and Marilyn Erickson as the owners and our daughter and son in law, Kenlyn and Greg Stewart are operating the vacation rentals. They live in Knoxville Tennessee and Ken and I are in Sedona Arizona. We discovered one of the most beautiful ocean front locations in the world. We were dazzled and are still amazed to this day. It is a top beachfront location on all of Maui and starts the 2 miles of pristine, uncrowded swimming, snorkeling beach that goes all across Wailea. The climate is the best on the island...less humid than other locations. Our top floor location above the palm trees gives an amazing panoramic view, and quiet times on the lanai. Being at the very south end of Kihei, and on the sand at the north end of the amazing Keawakapu Beach is as ideal as Maui gets. Just do a google map satellite Mana Kai view, and you will see why we chose this beautiful spot in Paradise. The stunning panoramic views, the miles of gorgeous sandy beach, the Mana Kai Resort complete with gourmet waterfront restaurant, lounge, Sushi Bar, Happy Hour plus a wonderful upscale Deli and country store. There also is a beauty parlor. The lobby area has a travel desk for all the Maui tours. The beautiful pool and waterfall are surrounded by tiki torches at night. Very romantic lovely atmosphere. Whole unit state of the art A/C. Installed in 2017. (2) Two new flat screen televisions. Pool, Linens, beach towels provided, Spectacular top floor view - on 2 miles of uncrowded sandy beach, New glass top stove, new frig, new drapes, new dining room set, Owners take pride in constantly updating the condo, In the one bedroom unit, sliding shoji screen separate the living room and master bedroom, Usually left open during the day to maximize the panoramic view. New gas barbecues on the grounds. A popular and welcome addition. Fine restaurant, Top of the line Deli, Sushi bar, Happy Hour, Water sports shop,Tiki torches, Best snorkeling & Best location!! !